Synopsis: A band of treasure hunters find their mission to retrieve diamonds from a shipwreck frustrated by zombie sailors. So begins Zombies of Mora Tau, a Sam Katzman production (i.e. 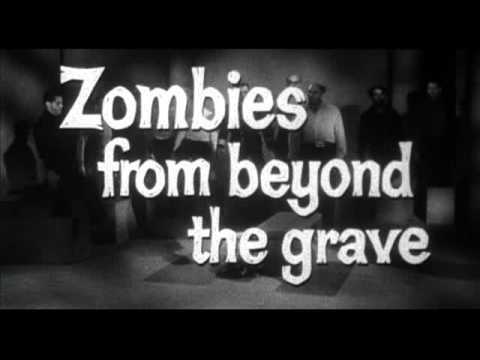 cheap) directed by genre director Edward L. Cahn, the title of which is a lot more interesting than anything in the movie – with the exception, perhaps, of the way that Allison Hayes’ breasts defy gravity as she lies prone on the floor of the zombies’ ‘room in a rock’ mausoleum. Cult favourite Hayes, who memorably played the title character in Attack of the 50ft Woman, plays Mona, the slutty wife of an opportunist named George Harrison (not that one) who has dollar signs dancing in front of his eyes at the prospect of salvaging those diamonds. Not even a guided tour from Jan’s Great-Grannie of the graves of previous parties who’ve attempted to retrieve the diamonds (which ends with four empty graves she’s thoughtfully had prepared for this latest group of treasure hunters) is enough to dissuade him. Mona has the hots for hunky diver Jeff (Gregg Palmer- The Undefeated, The Shootist), and isn’t particularly bothered about hiding the fact from poor George (Joel Ashley – The Great Locomotive Chase, Warlock). But Jeff prefers the much more wholesome Jan, which gives rise to all sorts of bitchiness from Mona until she falls into the zombies’ clutches and sits out most of the rest of the movie surrounded by candles, as fire is the only thing that will hold these zombies at bay. Although it benefits from the presence of a number of familiar B-movie ‘stars’, Zombies of Mora Tau is a dull affair enlivened only by a final reel in which the zombies finally begin to attack en-masse. 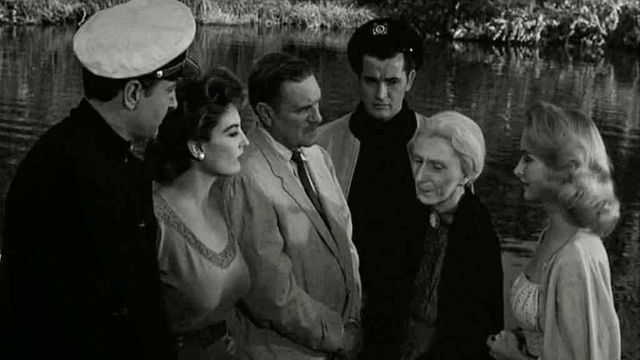 These so-called zombies are just blank-faced wrestlers with an occasional piece of seaweed draped over them, but the way in which their relentless, unthinking advance forces Jeff and his crew into an ever-smaller area of safety is a precursor of Romero’s Night of the Living Dead and serves as a template for many zombie movies to follow. That doesn’t mean Zombies of Mora Tau is one of the genre’s important or groundbreaking entries; it’s still a threadbare production which bears the evidence of its cheapskate producer’s commitment to cutting costs wherever possible – the ‘underwater’ scenes were shot through a fish tank! – and has a plot that finds a new way to defy logic with every fresh scene.